Babies in the NE Florida nest of Romeo and Juliet, Christmas, 2015. © American Eagle Foundation. What is the average number of eaglets per nest? How many eggs does an average bald eagle lay in a lifetime? What is the incubation period for bald eagle eggs? The average time for a Bald Eagle egg to hatch from when it was laid is 35 days. It can be a few days longer. How do the eagle parents care for the eggs? The female incubates most of the time, but the male also helps. They make sure the eggs are protected from the weather, and they ‘roll’ the eggs to keep all parts of the egg at the same temperature and to prevent the developing embryo inside the egg from sticking to the egg shell. Both parents are vigilant in protecting the eggs from predators or intruders to the nest. How Do Eaglets Get Oxygen Inside the Shell? The video below shows how baby birds (all kinds) get oxygen when they are still inside the shell. NOTE: The sound on the video is muted by default, so be sure to click on the sound icon located in the lower right of the video to hear. The video was produced by NPR. An egg tooth is formed on the eaglet as it grows inside the egg. It is actually a sharp point on its beak. At the same time, the baby eaglet develops a ‘hatching muscle’ which actually tips the developing bird’s head back. Once it is large enough, the egg tooth will come into contact with the inside surface of the egg. As the baby inside the egg moves around, this little egg tooth breaks through the shell, (called a ‘pip’) and after several hours or even a day or two, the baby emerges. If you are observing a nest with a camera and microphone, you can hear the tiny cheeps the eaglet makes even before it hatches. What color is a newborn eaglet? When first born, they are covered with down, and so light they almost appear white. By the time they are 9 – 11 days old, the first down is replaced by a second down which is much darker in color. Feathers begin to appear when they are about 24 days old. These are always very dark when they start to appear. The coloration from a baby eagle to an adult eagle changes over the course of 4-5 years until the beak and eyes turn yellow, and the head and tail feathers turn white. How fast do baby eaglets grow? Baby eaglets come into the world totally helpless. They cannot hold their head up; their vision is limited; their legs are too weak to hold their weight. 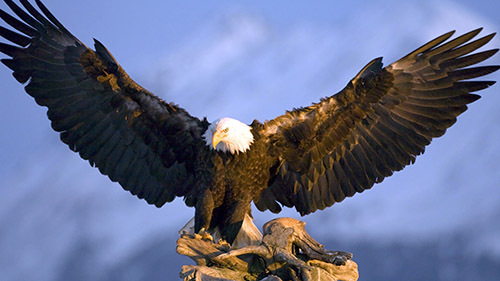 Bald eagles are altricial, which means they must rely 100 percent on their parents to protect them and care for them. 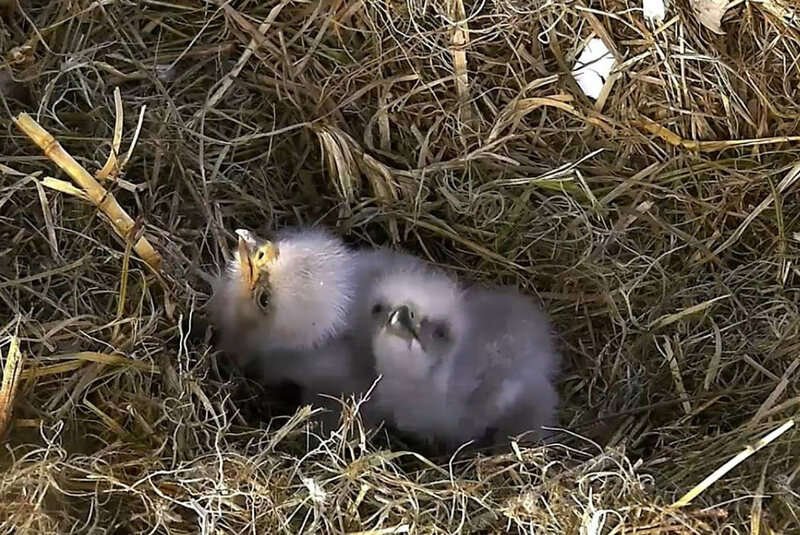 It can take days for them to completely hatch from the first pip to being totally free from the shell (in the nest of Romeo & Juliet in Florida, the first eaglet hatched (NE16) in 2016 took 40 hours to complete the process. Often, it’s much quicker than this. After hatching, the eaglet will dry off and fluff up to a downy gray. Food will be offered to the eaglet by the parent, who shreds meat off fish or whatever is available. Tiny pieces will be offered again and again as the eaglet struggles to hold his wobbly head still long enough to take the food. In a short time, the eaglet becomes stronger and his eating skills and coordination develop quickly. An eaglet has a crop – a storage area – below its chin. Food goes into the crop and is then digested as needed. When the crop is “full” you can see it bulging out. This crop is actually part of the esophagus where food is stored and softened. The crop regulates the flow of food through the digestive tract. How quickly do the eaglets grow? The eaglets grow rapidly, they add about a half pound to a pound of body weight every week until they are about 9-10 weeks old, depending on if the eaglet is a male or female. Females are always larger. At about two weeks, it is possible for them to hold their head up for feeding. At about three weeks they are 1 foot high and their feet and beaks are very nearly adult size. At about three to four weeks old the eaglets are covered in a secondary coat of gray down. At about four to six weeks, the birds are able to stand, at which time they can began tearing up their own food. At about three to six weeks, black juvenile feathers will begin to grow in. While downy feathers are excellent insulators, they are useless and must be replaced with juvenile feathers before an eaglet can take its first flight, some 10 to 14 weeks after hatching. At about six weeks, the eaglets are very nearly as large as their parents. At about eight weeks, the appetites of the eaglets is at its greatest. The parents will hunt almost continuous to feed them, meanwhile at the nest the eaglets are beginning to stretch their wings in response to gusts of wind and they may even hover for short periods. The eaglets grow stronger. At about nine to ten weeks, they begin branching, this is a precursor to fledging. Around ten to fourteen weeks, the eaglets will fledge, or fly away from, the nest. Once the eaglets have fledged they may remain around the nest for four or five weeks, taking short flights while their primary feathers grow and strengthen. Their parents will still provide all of their food. The juvenile fledglings, with the exception of their color, look similar to their parents, but are nothing like them in behavior. The juveniles now have to learn to hunt, and they only what’s left of summer to learn. After that, they’re on their own. The first winter is the most dangerous and difficult part of an eagle’s life. Where are the parents when they are not in the nest with the babies? Most likely the parents are off hunting for food for the eaglets. They do not seem to be very far away. One always seems to be close by the nest. How do baby eaglets learn to fly? How long do the young stay with their parents after fledging? How do young eaglets learn to hunt after they leave the nest? Young eagles from wild nests develop their hunting skills on their own, but spend considerable time after they fledge watching their parents, and undoubtedly learning by watching what the adults do. The actual skills involved are learned by trial and error. The drive to hunt, is innate, as can be seened by hacked eagles, fledged into an environment without adults around to ‘teach’ or show these young birds. Yet, the eaglets that were hacked, learned to hunt for themselves and survive. It is important to provide food at the hacking towers or on the edge of a lake close by to give them a source of food for as long as they needed it. In time, each eagle at its own pace, stopped using the food provided by the caretakers who operated the hack towers and began foraging on their own. Do adult bald eagles push their young out of the nest to encourage them to fly? If an eaglet falls, will a parent fly below the nest to catch it and carry it back to the nest? How long do nestlings stay in the nest? Eaglets hatch after 35 days of incubation and are in the nest for 10-12 weeks before they fledge or take their first flight. Often, the fledging process is gradual, where the birds may branch, leaving the actual nest but not the tree, and take another few days or perhaps a week to actually fly away from the nest tree. Then, they return after they calm down and realize that wasn’t so bad, and was actually fun! Once they leave the nest, will the eaglets return to the nest or take off for good?